The demand for perfect teeth is ever-increasing and last year nearly 1 million people started orthodontic treatment but what are the risks? Along with tanning skin, highlighting hair and HD’ing eyebrows, cosmetic dentistry is in high demand. One of the most popular methods to achieve a better dentition is through orthodontic treatment to straighten out overlapping, under-erupted and rotated teeth. Two recommended methods of orthodontic treatment are, fixed braces (also colloquially known as “train-tracks”) followed by retainers or clear aligner therapy. Gums – As with all treatment, there are some risks to consider as the roots of the teeth are held in place by a periodontal ligament and supporting bone and tissue. 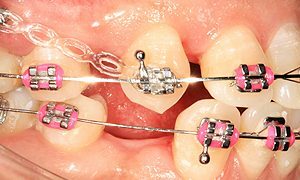 When manipulating the teeth into an alternative position, the orthodontist must ensure that this is achieved in a way which will preserve the supporting bone and tissue. Therefore, before providing any orthodontic treatment, the practitioner must assess the full dentition of the patient to ensure their gums and teeth are healthy enough to withstand such manipulation. Otherwise, as has been the case for some of our Clients, one or more teeth may be compromised and lost when orthodontic treatment is carried out. Occlusion – In most cases, if teeth are overlapping considerably, this is usually due to over-crowding and the most common solution is to remove some of the teeth to create space for the others to line up. It may sound simple, however, it can be vital to preserve the correct biting occlusion and ensure the opposing teeth meet correctly. When orthodontic treatment begins, an appropriate assessment of the space in the mouth must be undertaken because if there are too many teeth, the teeth will not align and will become deranged. 1. If a patient’s bite is allowed to become deranged our mal-aligned, this can cause pressure points between opposing teeth when chewing or even talking which then causes pain, sensitivity and/or teeth to chip each other. Equally, a patient’s jaw may be misaligned as a result and this can cause discomfort around the jaw line and even cause temporo-mandibular joint dysfunction. 2. In some cases where clear aligner therapy has been recommended, this has caused rotation of one or more teeth in that it faces sideways as opposed to facing out of the mouth. This may not have compromised the tooth but is disheartening to a patient who may have paid a lot of money for orthodontic treatment that is unsuccessful. In some cases, this rotation may be due to poor orthodontic treatment. 3. A patient who has gums in poor health who has orthodontic treatment may find that one or more teeth change colour, become mobile or move back into their original position after the orthodontic appliance is removed. This may not only be a sign of poor orthodontic work but may suggest that orthodontic treatment was not recommended treatment and that dental treatment for decay or gum disease should have been carried out first. In the right hands orthodontic treatment is completely safe and undertaken by many every day, but it is vital that the dentist undertaking the work appropriately assesses the patient prior to carrying out treatment to avoid some of the problems I set out above. If you have had orthodontic treatment you suspect may have been negligent, badly planned and/or caused the health of your teeth to deteriorate, we at the Dental Negligence Team would encourage you to seek the opinion of an alternative dental specialist. You can find an appropriate specialist by checking their registration on the General Dental Council’s website. We would also advise that you contact one of the lawyers specialising in dental negligence in our Dental Negligence Team for advice as to whether you may have a claim for the injuries you have suffered. Claims can include the costs of treatment already paid for and also any future treatment you may require as a result of the poor treatment. I have had braces when I was 14. My teeth at the time aligned but I was not happy with my smile As it went side ways, and adding elastics to my braces caused my upper jaw teeth to move considerably down and my smile is moved to the left. I was also recommended surgery, but was told once and not told again, and was not sure why I would need it. After a year or 2 I got a gap In front of my teeth. I could not bite properly and when chewing, my back molars, and jaw joint would hurt, especially eating an apple or Beguette. So I went to my dentist again and requested me to move to dental hospital. As I’m 25, I do not have the money to pay for my dental treatments. After going to the hospital, they analysed my teeth, X-ray them and came to a conclusion I would need surgery on my upper jaw as the jaw is putting pressure on my bottom jaw and my upper jaw is really narrow. Unfortunately I had to do my own research, the surgeon did not tell me what the surgery was called and what is consisted. After searching the net for several days I figured out it was called SARPE surgery. I then came up with some questions and booked an appt with my surgeon to find out answers from himself personally. Only then I found out what it actually consisted off. I asked the surgeon my self how did it go, but he did not say anything. I was confused As the surgeon does these type of surgeries all the time and how is my tooth damaged? I was new to the root canal As I do not have any fillings/crowns In my teeth. I asked if it’s necessary and they recommended yes, and I would need to get root canal done before my top braces get on, after the expansion metal In my mouth is removed. Also there is this orthodontist In America/ LA called Sam Muslin, he does not recommend surgery and believe he can fix the jaw and teeth without surgery. Any possible the NhS can fund me to get my teeth/jaw fixed from there? Thank you for your enquiry. One of our team, will be in contact with you shortly. I am 58yrs lady, I started orthodontic treatment in june2013. I was a class2/2. I was naturally missing my second incisors and to disguise this my two centrals and two canines had been crowned years ago to fill the spaces. I decided to have orthodontic treatment and plan was to cut down these lge crowns and move teeth to a position where the two missing teeth would be replaced. The front teeth were slightly retroclined so they were to be brought forwards and lifted and lowers were to be brought forwards and intruded. After 17 months my teeth looked so nice, never thought they could ever look so good. Then had an appointment with the general private dentist to see how far we were with making space. At that appointment they then said I should now make the premolars into canines and not replace missing teeth. Didn’t want to do that as I knew space would be closed and my arch would get narrower. He assured me it wouldnt and in fact was insisting I dont need missing teeth even though that was the reason I started treatment in the first place. Everything went wrong after this. My upper teeth got pushed back. My lower teeth are pulled back. My upper arch has been narrowed. My lower jaw has retruded causing tmj problems. My smile is terrible teeth are sunk in and my face is sunken in at midface and I don’t have lip support. Upper teeth are pulled down and back and ive suffered stinging burning pain in the roof of my mouth and nose and severe stinging in my eyes. I have unaesthetic facial changes. My nose has dropped due to my teeth so far back which is not supporting my face. I feel I will now need a maxillofacial surgeon to correct these problems as everything gone backwards. Any advise on who I should consult with. My son started his orthodontal treatment in 2009 when he attended Hull Hospital and was seen by a Maxillofacial Consultant. From there he was referred to a local dentist who was qualified or so we were told in orthdontal treatment. My son firstly was given twin block braces. This was later followed by four teeth extractions in his local dentist in Yorkshire, which I arranged in liaison with the orthodontist as my son had overcrowding. A fixed brace was then put on his teeth. He was at boarding school at the time and attended a local dentist/orthodontist. The brace remained and my son left sixth form in 2014 he then moved to an orthodontist in Wigan which was near home in St Helens. He still has the fixed brace in his mouth and it is now 2017. He is now coming up to his last year in University and is 20 yrs old. Each time we have asked for the plan…..it has always been a “few more months” I am worried that underneath the fixed brace there may be marks. In addition, my son’s teeth appear to spay out now rather than align in a straight manner. He has also had a gap at the front left of his teeth. This has been treatment on NHS. I am concerned that the last two appointments have been cancelled when my son made the effort to miss lectures and go during the storm on the train only to be told his appointment had been cancelled. I feel as a mother I have been neglectful, but always hopeful that the orthodontist will get a grip.